One of the first steps in learning to weave with Navajo techniques is to acquire an appropriate loom. 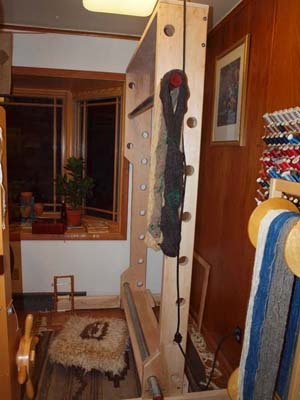 If you already have a tapestry loom, it can probably be adapted to Navajo style weaving. You can also make a small Navajo loom from a picture frame or canvas stretcher bars. This link will give you the free plans for a small workshop sized traditional Navajo loom like the ones in the picture above. Want to build something larger? Check out the loom on at http://www.woolgatherers.com/PLANSPAGE.html. It’s based on the loom used by the weavers who demonstrate at the Hubbell Trading Post National Historic Site. The plans are $50, but they are a standard blueprint and the loom is so stable that you could probably build two of them, put of roof over it and live in it. Weaving in Beauty has no financial interest in Woolgatherers and we don’t receive any money if you purchase the plans. We just like the plans and some of our students have used them. It sounds like you have the loom built but you need instructions on warping, which the plan doesn’t cover. There are a number of books that you can use for reference on that. Working with the Wool, Navajo Weaving Way, Navajo and Hopi Weaving Techniques and our book, ‘Atł’óhí Binaaltsoos (The Weaver’s Book): How to Weave the Navajo Way are all potential sources of information on that and may be available through your public library. I’m having the same issue Debra had–the instructions for the *frame* are in the PDF, but not those for all of the interior components (turnbuckles, dowels, conduit, wire, twine, etc.). I would imagine the placement measurements are important here (e.g. how many inches from the top of the loom should the pipe straps be attached? ), but is it ok to just eyeball it..? Linda, you will need to locate a book or video on Navajo techniques. There are several books available. You can usually find Navajo Weaving Way through your public library or at Amazon.com. You can also use Weaving the Navajo Way by Caroline Spurgeon. It’s also available through Amazon.com. You can also use the book that Liz Munk, Jennie Slick and I wrote. It’s available on this web site at http://weavinginbeauty.com/weavinginbeautymercantile/publications. Janice, you’lll need to get a copy of our book or another text on Navajo weaving to be able to complete the warping. It isn’t difficult, but it’s not exactly intuitive. You can buy our book here. You’ll also find warping instructions in Noel Bennett and Tiana Bighorse’s book Navajo Weaving Way, which you may be able to find at your public library. My husband has built this loom for my legally blind mother, but we can’t figure out how to warp it. I have an image and I can’t figure how to get the warp threads anywhere close to what the picture looks like. Are there any videos out there you could direct me to? I’d appreciate any help you can give me. Debra, if you have any other questions after our chat this morning, just let me know. I bought the materials to make the loom. I read the direstions on pdf that details how to put the frame together. How do I find out how to assemble all of the interior components (turnbuckles, dowels, conduit, wire, twine, etc)? The download is available on the page. If you have a problem getting the file, just send me a note using the contact us link at the top of the page. Assemble as directed in the PDF. It doesn’t make that much difference, but the directions in the PDF have produced working looms consistently. Yes, Jo, you would just use a smaller frame. You can even use a picture frame or canvas stretcher bars for a true miniature. WOW! This is a cool loom. I’m soon retiring from work- been looking for a past time hobby that usn’t too hard on my budget. Could I get the instructions on how to build one of these looms? I noticed the bottom crosspiece in the 2 looms shown in the photo above are placed differently than described and shown in the downloadable directions…Is this a concern? Should I assemble it like it is in the photo above or as directed in the pdf or does it not really matter? I’ve asked my husband to build this for my legally blind mother. I handed him the plans and his only question was what does the finished product look like. So we had to come back to your website so I could show him. Once he understood what he was going to be building he thought the plans were great. Could you add a photo of the finished assembled loom, and perhaps another picture of the loom warped and ready to weave to the plans? The first picture would be great for the craftsperson building the loom, the second would be great for the inexperienced craftsperson who will be working and using the loom. In my case, I have to learn how to warp it and weave with it so I can show my mother. Thanks so much for putting these plans out there! Have perused the websites, bought the books! No one explains how to alternate the sheds for weaving! The nails are part of what you need for the warping process. They aren’t needed to build the loom. What are the twelve nails for? My husband wouldn’t put the metal pipe on it. He kept it all nature….thanks for the plans. Now I am almost ready to begin an adventure. The directions are only for building the loom and do not address weaving techniques. Our weaving techniques book, sold in the Weaving in Beauty Mercantile covers the knowledge needed to get started weaving the Navajo way. Thank you for contacting me! I guess this means that I should put a link to our classes on those plans! If you follow the Learn to Weave tab on the web site, you’ll see the Weaving in Beauty classes that Jennie Slick and I do in Window Rock, Arizona and Garden City, Utah. Next year, we’ll also be teaching at Convergence 2010 in Albuquerque. The loom itself could be used in any Navajo weaving workshop class, so you may also want to look at the Where to Learn Indigenous Weaving Techniques too. The link for our classes is http://174.121.153.8/~atlohi1/find-a-weaving-class/weaving-in-beauty-classes. You can certainly use your llama and alpaca yarns. I have seen one beautiful Two Grey Hills style rug done with llama. I haven’t used them myself, but there’s no reason that they can’t be used. The llama rug that I saw had a little difference in the hand and drape of the fabric, but you’d expect that because of the difference in elasticity of the fiber. The Navajos call the llama tl’izi bida’a, which means “the goat’s uncle” and quite a few people use llamas as guard animals for their sheep. Thanks for your interest in Navajo weaving techniques!